Everyone's raving about Slumdog Millionaire and Indian's in particular are celebrating its Oscar wins. And I think that's just dumb. I' mnot saying the movie is bad (or for that matter, good). And I don't have a problem with the fact that it's helped get some attention to the problems of the slum dwellers. Or even the fact that it's got the talent of some of our artists acknowledged on a global stage. But while the cast, the story, the background may be Indian the fact of the matter is that the movie itself is not. So why claim that we've finally made it to the Oscars (and won) when it's not a Bollywood film? Why not double our efforts and have an actual, through and through Indian movie win (not that winning an Oscar should be given so much importance but that's a rant for another time). The Kite Runner was set in Afghanistan and had an Afghani cast but you wouldn't say it was an Afghani movie, would you? So why this desperation to be recognized in the West? Why this craze over Rahman winning an Oscar when he has been consistenly winning awards and we already say that he's one of the best composers in our film industry? And the funny part is, most people I know are saying that this isn't even his best work! They opine that it's only because the movie isn't Indian that he's got the exposure and the award (which may very well be true but not necessarily a bad thing). So let's not go crazy about this one movie when we pump out hundreds in a year. And where we have so many indigenous titles that are worth watching. From what I hear/ read, this isn't even a great movie, just a good one. P.S. You may remember when I posted about why I didn't vote for the Taj Mahal. Yes, I do like to rant about these things and go against popular opinion, but usually just to play devil's advocate. We had a company sponsored movie screening today. We'd had the option of watching Delhi-6 or Billu Barber; an overwhelming majority voted for Delhi-6. The movie was decent - I thought that the basic concept was interesting, taking the Monkey Man incidents and weaving the story around them. The cinematography was really good and all the actors are worth their billing. And this is the first Bollywood movie I've seen where computer imagery and special effects were used (pardon the pun) to good effect. Roshan's (Abhishek Bacchan) dream sequence where his vision of the West and the East amalgamate was especially well rendered. The first half of the movie was good, nothing great but a relaxing watch about nothing in particular; a light (if somewhat clichéd at times) mix of coming back home, the big heart of Delhi, the shortcomings of India and how it all just brings the people closer together. However, the second half transitions into something darker which is followed up with melodrama that is a bit too heavy and preachy. Rakeysh Mehra may have wanted to bring a touch of reality to the tale but (and while all ends well), the magic is lost. In conclusion, the plot starts off promising but ends up being just average, perhaps even a little disappointing. A good option if you have nothing else to do. But there's no need to rush to the halls. I've activated Trac for bug tracking, so the link has been changed. Death Is A Sanskrit Dictionary? So I was watching Dead Like Me - Life After Death the other day and the introduction sequence had this comic panel. 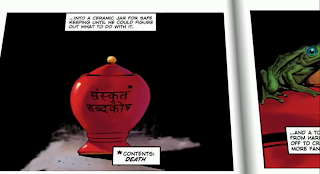 Well, the jar doesn't actually say Contents: Death. It reads Sanskrit Dictionary! I thought that was hilarious! And kind of sad actually, that the filmmakers figured any 'alien' looking script could pass off as God's writing (that they picked the Devnagri script may just have some hidden cosmic significance though!). They might as well have used Klingon!